"Take a picture of your life, remember what it looks like before it all changes"...I came across this line today in a photography magazine and it immediately captured my heart. It left a big dent in my soul when I realized how true it is. 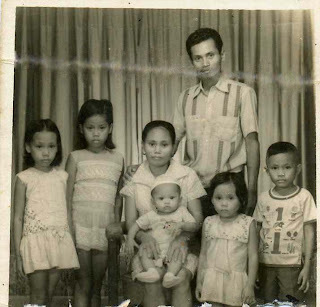 I found this photo of our family when I was about nine years old. I never thought I still have it because I've lost all my old pictures 10 years ago when I moved from Manila to my hometown General Santos. The story behind the incident is another story to tell. Looking at our picture brought back so many memories of my childhood that I have always treasured. I became so nostalgic and I miss my family even more. Yes, I have always enjoyed taking pictures of anything around me but rarely did I point the lens at my own life, at the things that are meaningful to me. Mostly, I take photos of striking sunsets, lake reflections, strangers and sceneries. I'm really glad now that I took so many pictures of my family and friends a couple of months ago while on vacation in the Philippines and with my daughters Michelle and Rhea on our life here in the US. Life does change way too fast and it's easy to forget what truly matters. Pictures like this helped a lot in reminding us of the way it was and how far we have gone in our life. There are many great moments in our lives that we could never replay, but if we capture it in photos, the feelings and the memories are preserved forever. Hi Ams, this is really a neat family photo.